Note: Demand for our products has increased greatly, hence you may find products showing as out of stock. We are working to increase production accordingly. So please keep an eye on our website if you want a product which isn't available currently, we're working on it! 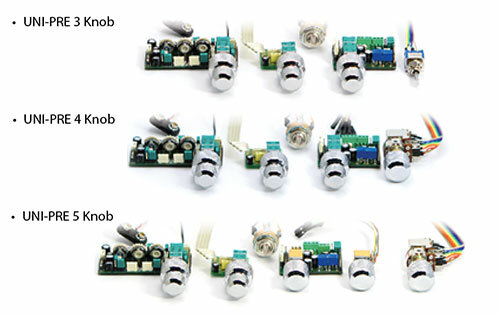 John gives a complete walkthrough on how to install a J-Style preamp. We've been greatly heartened by the response by users of our UNI-PRE, one of our more recent designs. We've been told, in no uncertain terms, whatever we do, keep producing it! The UNI-PRE was designed in order created a fully optimised and integrated onboard bass guitar preamp system, avoiding the compromises of conventional approaches. As well as designing out compromises, John has included a number innovative features, taking things to the next level. Remember, most of his working background has been with high end pro audio design, born of his work with SSL (Solid State Logic) and Sony Pro Audio during the period from the late 70s until the mid 00s. In 2005 he decided to move his full-time design efforts closer to where his heart lies - with the music, in the form of enhanced electronic products for musicians, the real creators. Here's an example of a great musician, Liam Tillyer, who chose a UNI-PRE for his Fender Jazz V.
The UNI-PRE is available in 3, 4 and 5 knob versions. It’s one of our latest designs that sets new standards with unique features, designed to fit virtually any bass which has 3, 4 or 5 knobs with rear cavity electronics. The modular construction makes for easy installation, with simple plug connections between modules. External wiring, such as pickups and power, are simply connected using screw terminals. The UNI-PRE was designed as an upgrade from the U-Retro and sets new standards with unique features, designed to fit virtually any bass which has 3, 4 or 5 knobs with rear cavity electronics.